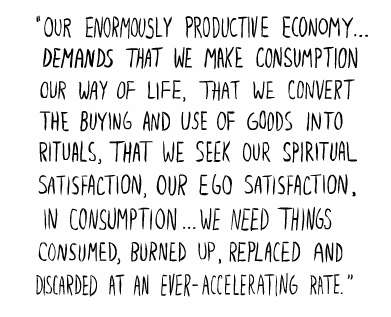 the measure of social status, of social acceptance, of prestige, is now to be found in our patterns of consumption. The very meaning and significance of our lives is today expressed in consupmtion terms. This is Lebow, in 1955. What would he be saying today? My appologies, and thanks Steve. I stand corrected. I appreciate the mea culpa and the explanation. You are right, it is a long post, but it does let any others on the trail of Victor Lebow know where I’ve already looked. And in my defense, there is a summary at the top so you can go directly to what you want. Anyway, thanks for this post. It already sent someone to the original.